Come contribuire alla formazione dei docenti per raggiungere una maggiore consapevolezza e acquisire migliori competenze per istruire una cittadinanza attiva in un mondo dominato dai media digitali? The SPACIT study can be considered an ongoing way of learning and teaching, aiming at the critical appropriation of the space in democratic ways. Its final aim is to give students a concrete tool to consciously get possession of the universe from the physical and socio-political point of view. SPACIT seeks to examine the concept of Education for Spatial Citizenship, a new research field. Education for Spatial Citizenship represents an attempt to include geoinformation in secondary education. It is based on the assumption that lay users of digital media utilizing geographical information (geomedia) may play a role in the appropriation of space – thus in emancipating education and citizenship. A spatial citizen should be able to interpret and critically reflect on spatial information, communicate with the assistance of maps and other spatial representations, and express location-specific opinions using geomedia (Jekel et al, forthcoming). 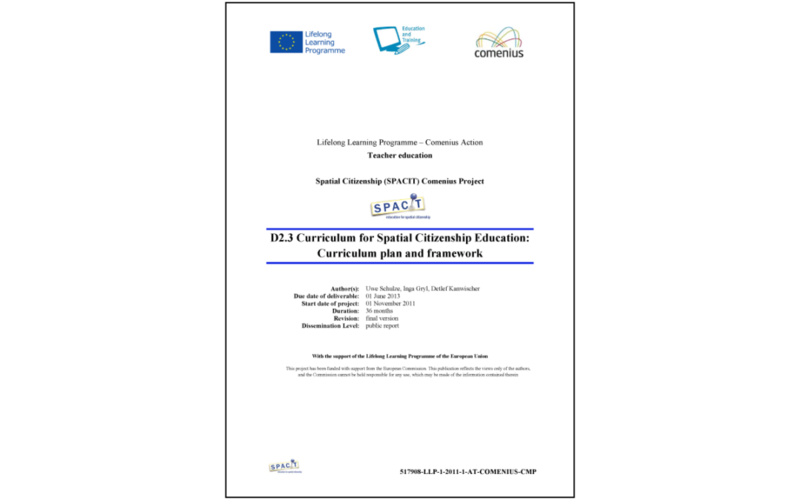 The SPACIT project finally aimed at understanding and explaining how spatial citizenship can better contribute to providing teachers and indirectly students with the skills necessary to transform the world. The target group selected for the project, i.e. secondary-school teachers, in-service and pre-service, provides the advantage to be able to transmit spatial citizenship skills to students through the formal education they are offered in schools. Teachers are therefore the targets of the SPACIT online-offline blended course, designed by the partnership following a SPACIT competence model. The methodology for the development of the competence model was based on the definition of the knowledge, attitudes and skills (KSA) that teachers should acquire through the SPACIT course. 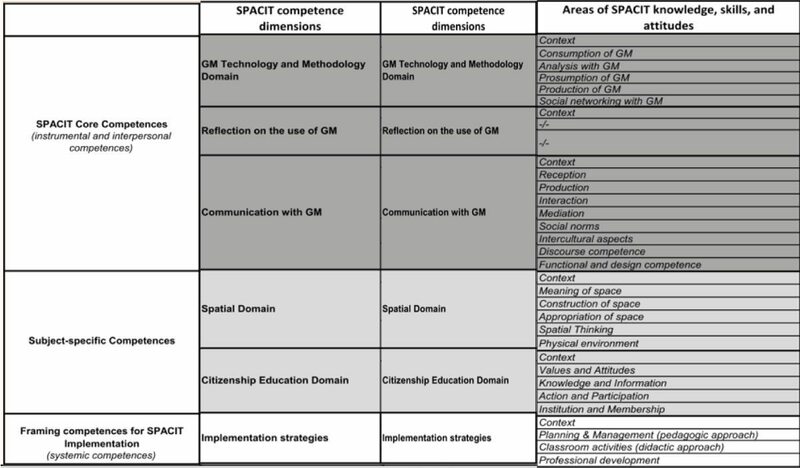 As the SPACIT approach is rather multidisciplinary, a three-step methodology informed the creation of the competence model: the first step consisted in a content-analysis of the existing literature on competence modeling; from the matrix of competences obtained, a first set of KSA was derived, which was finally integrated with competences from neighboring domains and renowned European competence models. The core competences identified were: (a) “Geo-media Technology and Methodology Domain, (b) Reflection on the use of Geo-media and (c) Communication with Geo-media” (Gryl & Jekel, 2012). Horizontal competence domains, such as “Spatial domain” and “Citizenship Education” were integrated with the core ones, developing the final SPACIT competence model (fig. 1). Fig. 1 Detailed structure of the SPACIT competence model (Gryl, Schulze & Kanwischer, 2013). The curriculum of the SPACIT course was developed on the basis of the competence model, and integrated the European Credit Transfer System to be easily transferrable to formal education settings, such as university courses. The curriculum is organized in four modules of learning, namely “Concepts of Space”, “GM Technology and Methodology”, “GM Communication and Reflection”, and “Concepts of Citizenship Education”, and is thought as an adjustable learning path, that the course-takers customize according to their learning needs and expected outcomes. Each module is organized in four units, which include different phases (fig. 2): preparation or introduction, exploration of the topics, potentials of application, and autonomous application by the course-taker. Given the flexibility of the course, SPACIT has been defined as a learner-centred course, where course-takers are free to create their own learning paths and activities they want to take. Fig. 2 SPACIT Curriculum (Gryl, Schulze & Kanwischer, 2013). Another element characterizing the course is the blended learning: activities can be partially or totally carried out in a digital learning environment or adapted to a face-to-face interaction. 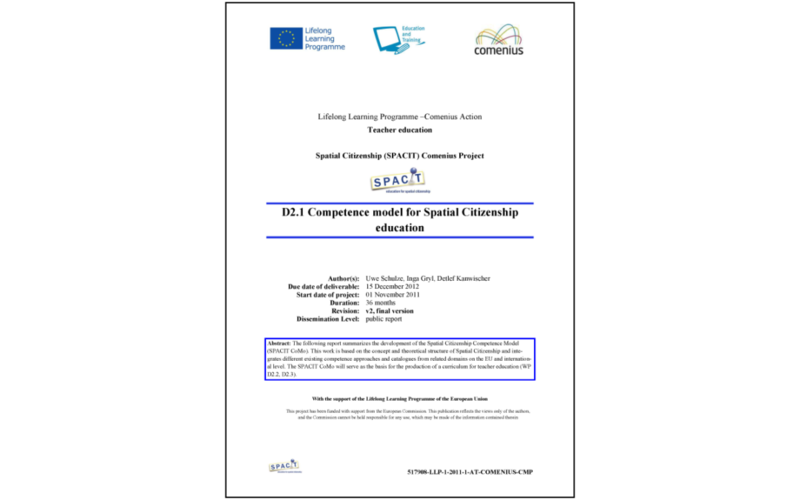 The former is organized on the learning platform “Moodle”, or as fully downloadable course from the project website – www.spatialcitizenship.org; the latter was organized as the training course for the evaluation of the SPACIT course in Iasi, Romania, in July 2014. Moreover, the SPACIT course is currently taught face-to-face by the GIZ Department of the University of Salzburg as part of their teacher-training programme. JEKEL, T., GRYL, I. & SCHULZE, U. (forthcoming). Education for Spatial citizenship. In: MUNIZ-SOLARI, O., DEMIRCI, A. & VAN DER SCHEE, J., Geospatial Technologies and Geography education in a changing world. Tokyo: Springer. Gryl, I. & T. Jekel (2012). Re-centering GI in Secondary Education: Towards a Spatial Citizenship Approach. Cartographica: The International Journal for Geographic Information and Geovisualization 47(1), pp. 18-28. Gryl, I., Schulze, U. & Kanwischer, D. (2013). Spatial Citizenship: the Concept of Competence. In: Jekel, T., Car, A., Strobl, J. & Griesebner, G. (eds. ): GI_Forum 2013. Berlin: Wichmann. 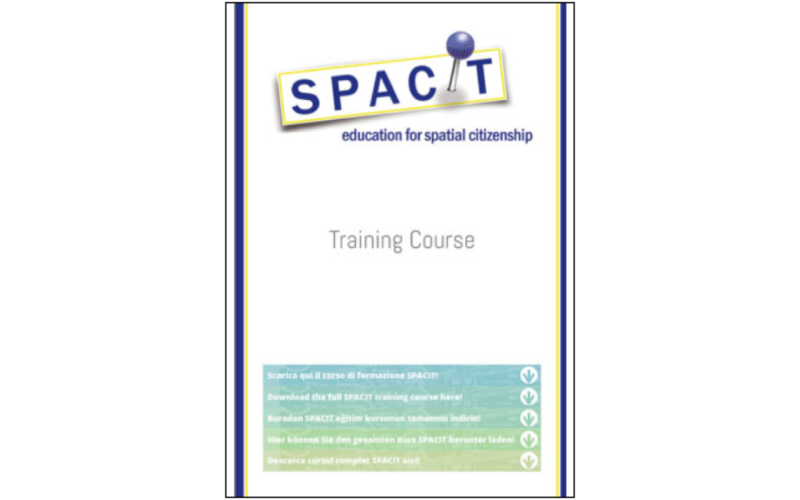 The SPACIT blended training course is the main outcome of the SPACIT project. It is a multi-lingual training course for teachers, educators and teacher trainers either available for face-to-face study or online in project partner languages – English, German, Italian, Turkish and Romanian. The course aims to provide teachers with the necessary skills to support the active participation of their students in society through geo-media. The report includes curriculum plan and framework for Spatial Citizenship, provided for national and local initial teacher training and in-service teacher education. It is based on the ECTS system and is connected to the Bologna Process. It deals with aspects such as learning outcomes, qualification and credits and aspects of quality assurance. The leaflet gives an overview of the SPACIT project, its activities, its rationale, and information on what geomedia are and who the project partners are. 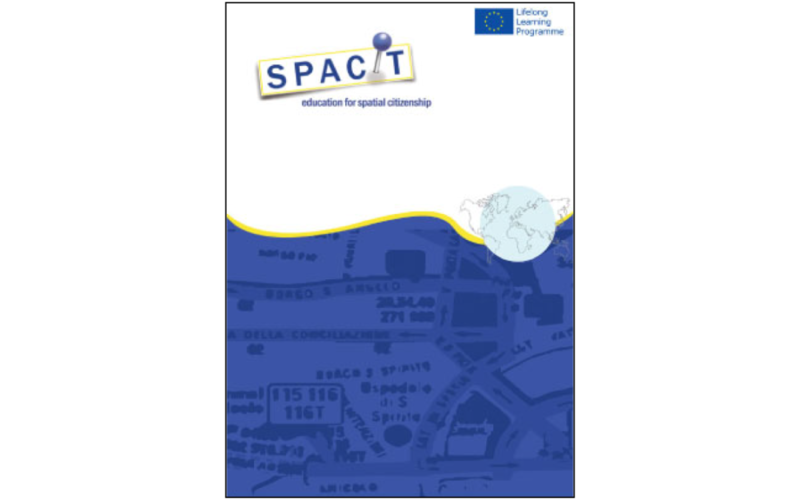 The SPACIT project was very fruitful in terms of publications on the project and on the topics of the project, specifically about Spatial Citizenship Education. The publications are organized by language. The report reviews competence approaches and suggests competences necessary for spatial citizenship, namely competences in the distinctive fields of absolute and social spatialities, spatial thinking, spatial communication and spatial participation. It produces a competence model and identifies measures to evaluate these competences. The SPACIT progress and results have been presented to teachers, teacher trainers and stakeholders, during conferences and/or workshops, on the national and international level, as well as through social networking sites. These are collections of the slides presented at the different venues, organized by language.